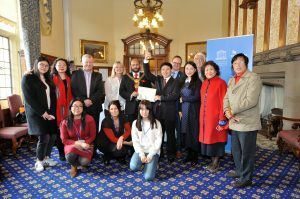 AWARD FOR HIGH PROFILE CHINESE FILM DELEGATE AT CIVIC CEREMONY TO MARK CHINA FILM WEEK IN BRADFORD. One of China’s leading film experts received an award last night (Wed 25 April) in recognition of his contribution to the world of film at a special Civic Ceremony in Bradford. 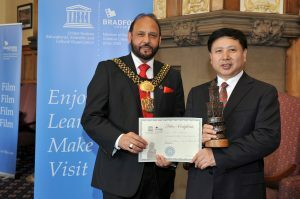 Mr Rao Shuguang, the Secretary General of the China Film Association received the award from theDirector of Bradford UNESCO City of Film, David Wilson. The Civic Ceremony was hosted by the city’s Lord Mayor and was part of the celebrations to mark China Film week in the city. Bradford UNESCO City of Film and its partners are hosting the delegation of film experts including Mr Rao Shuguang for the week-long visit which has enabled filmmakers and high profile individuals from China to meet with UK industry professionals in London and Bradford. Director of Bradford UNESCO City of Film, David Wilson said: “We are honoured to be hosting the delegation from China. The award was made to Mr Rao Shuguang in recognition of his contribution to the development of popular culture through film. Mr Rao has many years’ experience in developing film projects and promoting film culture in China and we hope to work together in the future to develop joint projects between UK and China using our UNESCO designation. We are also delighted to welcome colleagues from Qingdao – China’s first UNESCO City of Film as part of the delegation. The delegation flew into London on Sunday when the London Marathon was in full swing. In addition to meetings with the British Film Institute and other film professionals the group had a tour of Westminster where they met Bradford South MP Judith Cummins. Further film screenings and workshops are planned this week in Bradford and the delegation will also visit the Bronte Parsonage Museum as part of ongoing co production ideas for the future. In 2017 Bradford become the first European city to open a film office in Qingdao in China – the country which is home to the world’s fastest growing cinema industry. In the same year, Qingdao joined the UNESCO Creative Cities Network as China’s first UNESCO City of Film with assistance from Bradford. Bradford UNESCO City of Film has successfully worked with Qingdao and the China Film Association (CFA) to host China Film Week in London and Bradford this year.